We all love eating at home and even entertaining guests for dinner, but one thing which all homeowners dread about meals is washing the dishes. Thankfully, the invention of dishwashers has really helped most homeowners in reliving the burden of washing their dishes. However, sometimes your dishwasher needs some cleaning! Here are some of the easiest solutions for how to clean dishwasher pipes. 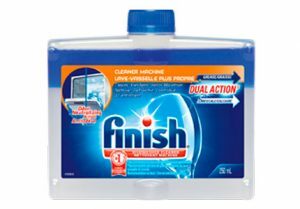 You will find both homemade solutions and special cleaning products, such as the Finish Dual Action Dishwasher Cleaner, you can get from Amazon right now! Along with our dishes, we put a lot of other things into our dishwashers as well. This includes food particles, grime, oils, and sometimes even the accidental food wrappers. 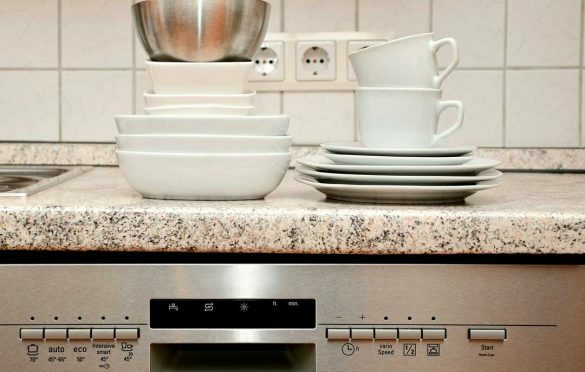 All of this can cause clogging of the dishwasher pipes, which must be cleaned in order to make the dishwasher run smoothly again. However, keep in mind that before cleaning your dishwasher pipes, it is imperative to turn off the power supply to your dishwasher to avoid any risk of injury. Often, your dishwasher pipes may be clogged up with food residue, dirt, oil, and grime which are causing the dishwasher water to back up into the dishwasher. Clearing out the dishwasher pipes with baking soda and vinegar can be a quick and effective solution. Create a solution of white vinegar and baking soda and put it in a small container. Pour the mixture on the bottom of your dishwasher. Allow it to sit for about 15 minutes. Add some hot water (not boiling water) to the dishwasher basket. This should help loosen up any grime, oils, and debris and clean out any clogs in your dishwasher pipe. Sometimes stubborn food particles get stuck up or jammed in your dishwasher pipe. These are not easily washed away with hot water, or even vinegar and baking soda. In this case, you will have to manually clean out the dishwasher pipe. Turn off the power supply to your dishwasher before you begin. Bring out your owner’s manual of your dishwasher and go through it to understand the anatomy of your dishwasher. Locate the dishwasher pipe, and using pliers, gently disconnect the pipe from the basin. You should ideally keep a bucket or a bowl underneath the pipe when you do this so that the bucket can catch any water and spills from the dishwasher pipe. Now, take a wire hanger and push it into the dishwasher pipe, trying to remove any stubborn residue, hair, grime, or other stuck particles. You should wear protective gloves and mask while doing this to avoid touching the dirt or breathe in any bad odors. Once you have cleared out the debris, you can run some hot water through the dishwasher pipe to clean out any remnants. Attach the dishwasher pipe back to your dishwasher and use it again! An alternative way to clean your dishwasher pipe after disconnecting it from the basin would be to use high-pressure water through the pipe. Disconnect the dishwasher pipe, and run a high-pressure water hose through the pipe. This will effectively clear out any dirt, grime, and debris from the pipe. Reattach the dishwasher pipe to your dishwasher and run it without any dishes for once cycle, to really clean up any residue from your dishwasher pipe. However, there are times when these easy fixes might not successfully clean your dishwasher pipes to the optimum. Or simply you are not able to disconnect the pipe from the dishwasher. In those cases, try out these commercial cleaners which will clean your dishwasher pipe and make it as good as new! A completely organic, non-toxic formula for cleaning your dishwasher and garbage disposal. 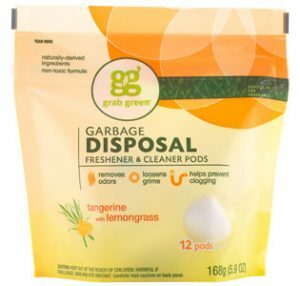 The fresh, organic smell will leave your dishwasher smelling like a fresh meadow and not like an old garbage bag! Very fast working solution; starts working within 30 seconds to 1 minute! While the cleaning pods do refresh your dishwasher and the pipes, there is no foaming effect from the cleaner. However, you can add a few drops of dishwashing liquid along with the cleaning pods to create foam and clean your dishwasher pipes. If you like your dishwasher to smell like fresh, organic aromas while cleaning it effectively in under a minute, Grab Green is the product for you! Click here to check the current price on Amazon. A fast and efficient dishwasher cleaner that targets all the hidden areas of your dishwasher; the filters, the pipes, and the spray arm. Best for removing limescale. The plastic the product comes in is slightly flimsy and can fall apart; however, if placed at a proper angle in the dishwasher, this should not be an issue. A pleasant smelling, easy to use dishwasher cleaner. Click here to check the current price on Amazon. 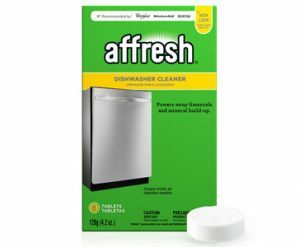 Just as promised in the product name itself, Affresh helps keep your dishwasher completely fresh and clean after every use. The lemony aroma left by Affresh can be a little strong for some users; however, by simply adding a few drops of citric acid to the cleaner, the strong smell disappears! For the busy homeowners who need to clean their dishwasher pipes effectively. Click here to check the current price on Amazon. This is some really good information about how to clean a dishwasher. I liked that you pointed out that you should try to clean it out often because it would help with efficiency. That is good for me to know as a new homeowner who really wants their dishwasher to work well.